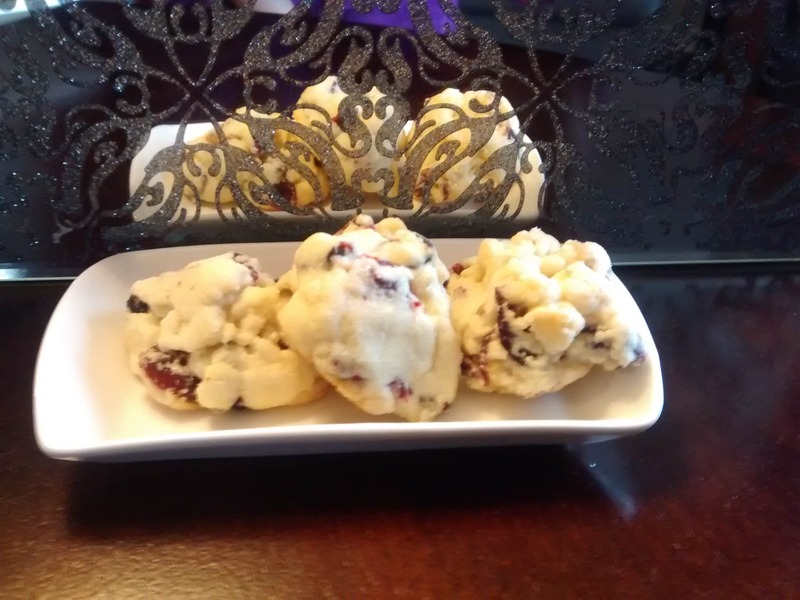 White Chocolate Cranberry Drop Cookies - THE OLIVE BLOGGER - Recipes your family will love! This is a festive cookie for sure, with it’s red bursts of cranberries and little chunks of white chocolate, everyone will enjoy this updated drop cookie! This recipe was originally taken from the Taste of Home website (http://www.tasteofhome.com/recipes) and they have a ton of others if you feel like browsing away for hours!! In large bowl (mixer) beat together butter and sugars until it is crumbly. Beat in egg and vanilla. In a separate bowl sift together the flour, salt, and baking soda. Gradually add to butter mixture and mix well. Stir in cranberries and chocolate chips until just combined. Drop by heaping tsp onto a greased (or parchment lined) baking sheet. Bake for 8-10 minutes until cookies are lightly golden around the edges. Even in their raw state they look so yummy! Do you have a film buff on your list this year? Here are few gift ideas to keep them happy! Movie Passes, that’s a given! Let them enjoy whatever movie is coming out next that they want to see! You can even add on a dollar value so they can hit up the concession stand! Goodie pack full of candies, popcorn and flavouring as well as chocolate and nuts! The perfect pack for any movie lover to have a marathon at home! Subscription to an at home streaming service like Netflix. This allows them to watch whatever they want, whenever they want at home! Do they have an all time favourite actor? Why not grab a bunch of their movies and give them a gift you know they will love! (Do some research and see if you can find movies they were in before they were a “big hit”)! Film of the month club subscription, there are so many to choose from! Comedy, Indie, Horror etc. This is a gift that keeps on giving throughout the year. Does your city (or a near by one) do a film festival? Grab some tickets to a show or two and gift those! Who knows, they might even get to see their favourite actor in person! Movie Poster of their favourite film, framed and ready to hang in their favourite movie watching spot! Can’t wait to make these, white chocolate and cranberries are great combo. Plus drop cookies are so easy to make. Thanks Gracie!! I hope you give em a try for your next cookie craving! Oh these look go good! I love cranberries and white chocolate! I’m pinning this for later! Thanks Lauren, they are a really nice treat!! Thanks so much!! I quite like them too, and the cranberries make me feel a little less guilty! These look delicious! I love white chocolate and cranberries together! They are such a perfect combination! Mmm! Yay!!! It’s the time of cookie-making and gift-giving. These look perfect for those obligatory Christmas Cookie Exchanges that are looming. My favorite time of year, cookies cookies and more cookies!! I hope you enjoy these as much as we do! These scream the holidays to me! I can’t wait to make them! They look so delicious! They are gorgeous on any holiday tray, and their flavors are perfect to put you in the holiday spirit! I love when cookies have dried fruit in them, the natural sweetness and the texture add so much to them. These look super yummy! Would be fun to make for a cookie exchange. Thanks April, they are perfect for it!! These look so good! I bet my husband would love them. What a perfect fall treat!! I want to try this weekend!